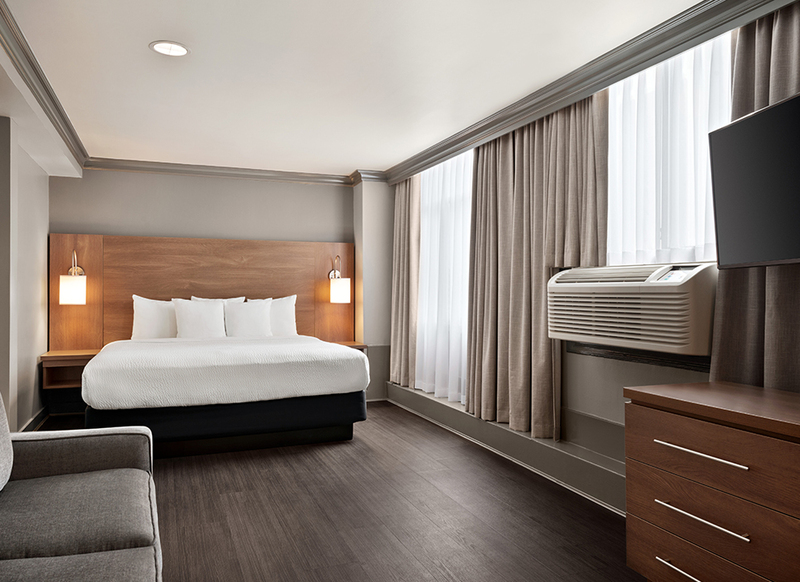 As one of the most affordable 100% non-smoking hotels in Downtown Vancouver, BC, the Days Inn Vancouver offers 85 tastefully decorated rooms and spacious one-bedroom suites that suit all of our guests needs during their stay in the city. 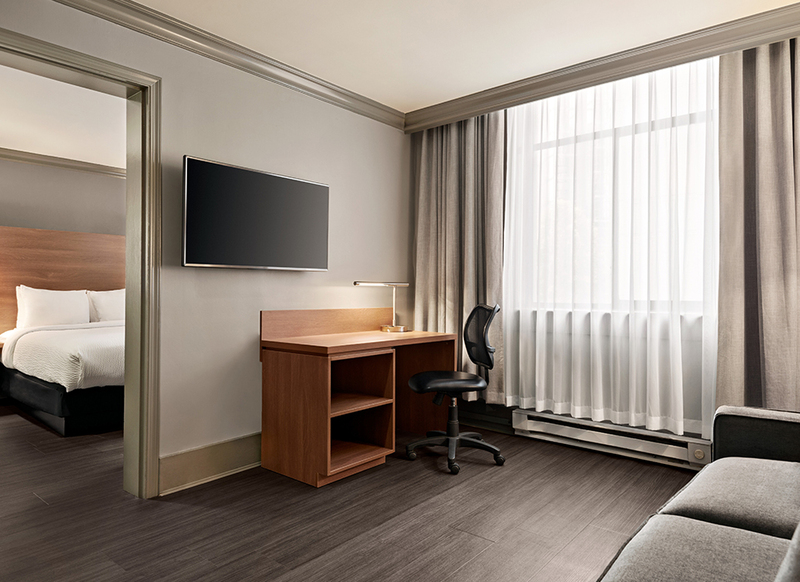 Our downtown Vancouver accommodations provide guests with the perfect level of comfort and convenience including room amenities such as mini-fridges, complimentary high-speed internet access, microwaves and coffee makers. 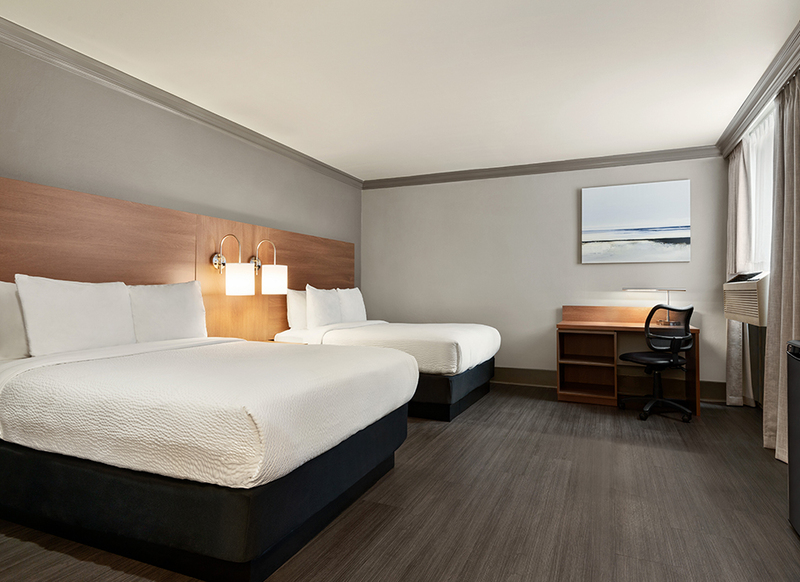 When you are looking for hotel rooms in Vancouver that offer everything you require for a comfortable visit, choose Days Inn Vancouver every time. As our guest, we welcome you to enjoy our hotel amenities and services including a business centre, laundry services, meeting room space, complimentary high-speed internet access and self-parking for a nominal fee. Book your downtown Vancouver accommodations using our secure online system for a quick and easy reservation confirmation. For corporate travel rates, group enquiries and special discount rates, please contact us directly. Perfect for singles or couples, the 200 square-foot Standard Room features one comfortable double bed with a shower. In-room features include a 32" flat-screen TV, a coffee and tea maker, and complimentary high-speed internet access. Maximum occupancy: 1 to 2 occupants. With a large comfortable queen size bed and bath and shower facilities, this 220 to 250 square-foot room is perfect for a couples getaway or those travelling to Vancouver on business. This tastefully decorated room features a 32" flat-screen TV, a coffee and tea maker, a work desk, mini-fridge and complimentary high-speed internet access. 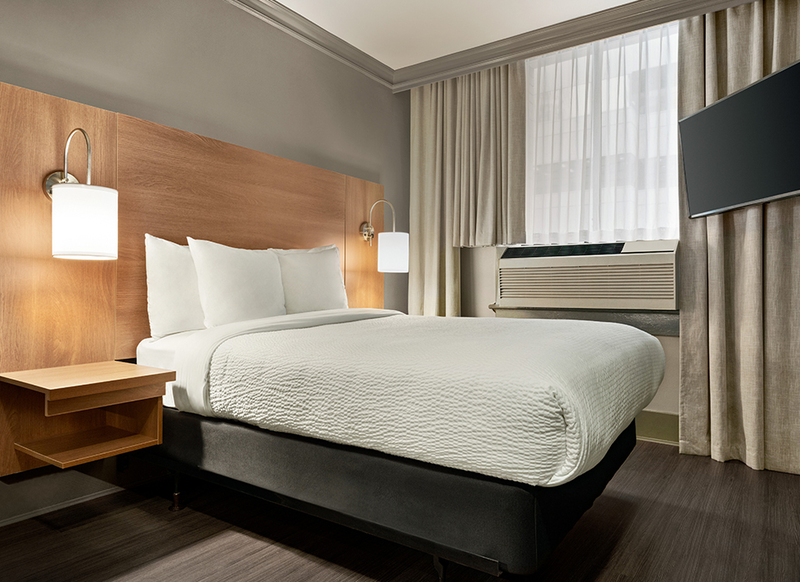 Our 250 to 300 square-foot Standard King room features a comfortable king size bed and full bathroom with shower. 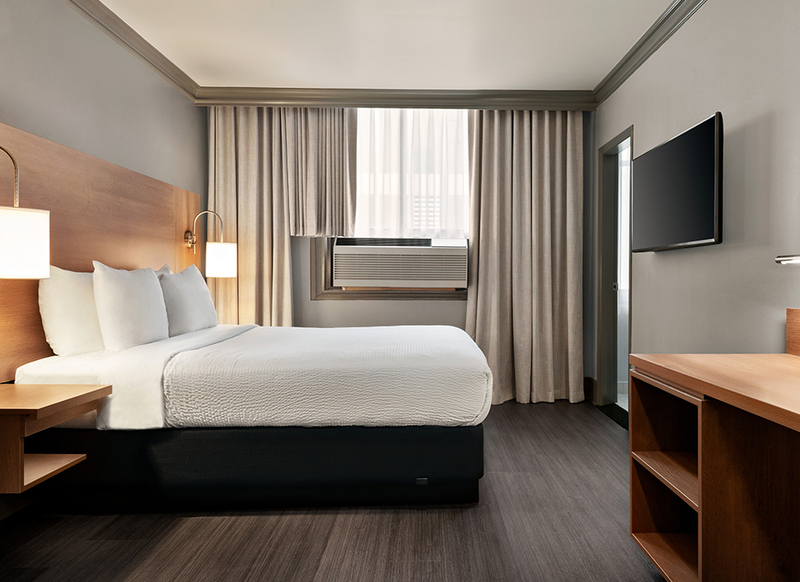 This spacious room with an open layout features a 32" flat-screen TV, complimentary high-speed internet access, a work desk, a coffee maker and a mini-fridge. Ideal for friends, families or groups travelling together, this 250 to 300 square-foot Standard Room offers two double beds and a bath with shower. The Standard Two Double room features a 32" flat-screen TV, a coffee maker, work desk, mini-fridge and complimentary high-speed internet access. Maximum occupancy: 1 to 4 occupants. 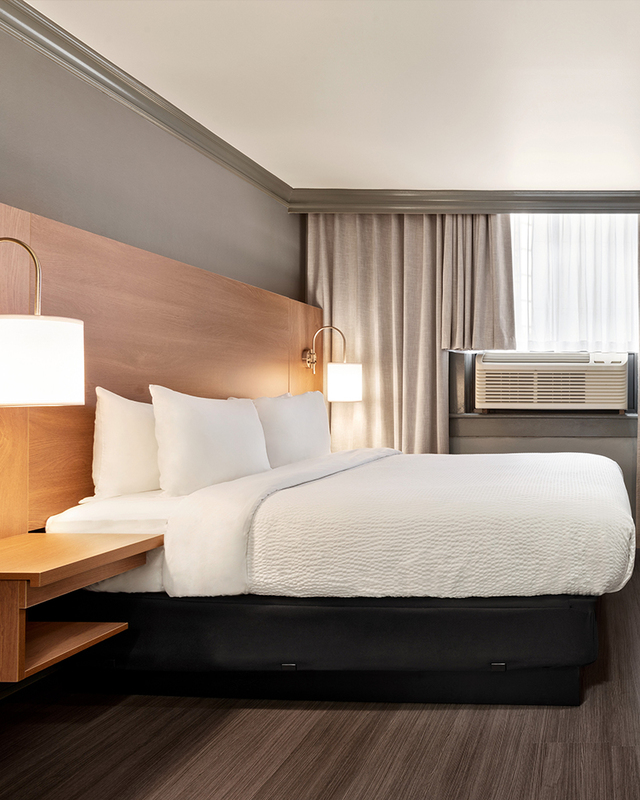 Enjoy space and comfort in our 400 square-foot Queen Suites where you will have the luxury of a queen size bed, full bathroom and separate living areas. Also featured is a sofa bed, mini-fridge, microwave, complimentary high-speed internet access, work desk and a 32" flat-screen TV.